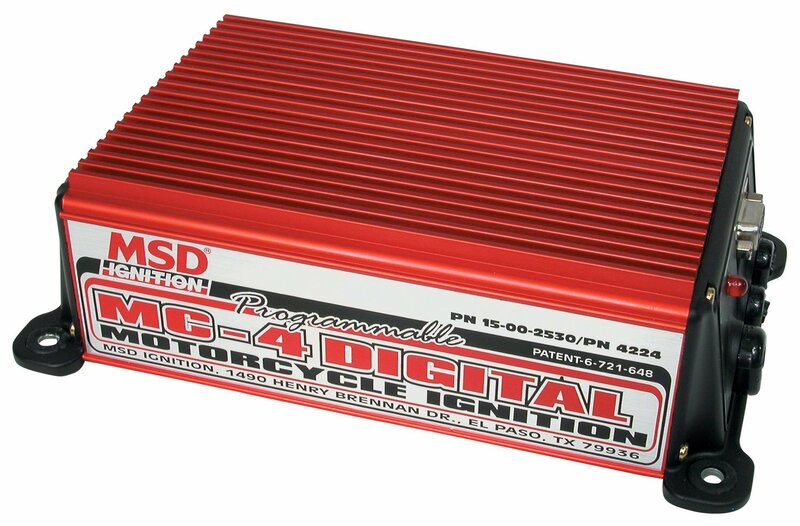 MSD's Programmable Digital-7 Series Ignitions have been powering the winning cars in NHRA Pro Stock, Outlaw Super Street and Pro Street classes for years. That technology is now offered to motorcycle racers with the MC-4 Ignition Control. The MC-4 provides the spark energy you expect from MSD with over 190 mJ of spark energy to each coil to fully burn the fuel mixture of high output race engines. Below 3,300 rpm the MC-4 delivers a long series of multiple sparks that burns in the cylinder for 20° to keep the engine crisp and clean at lower rpm. Every spark is at full power even through redline rpm to ensure the most power through top end. All of this spark energy can be controlled through an array of timing and rpm controls. The MC-4 is programmable with MSD's Pro-Data+ software so you can custom tune your timing and rpm parameters. Imagine being able to plot timing curves in 0.1° increments every 100 rpm! The window of tuning opportunity is wide open! With the incredible power and endless programming capabilities, the MC-4 is the only choice when it comes to igniting your race bike.